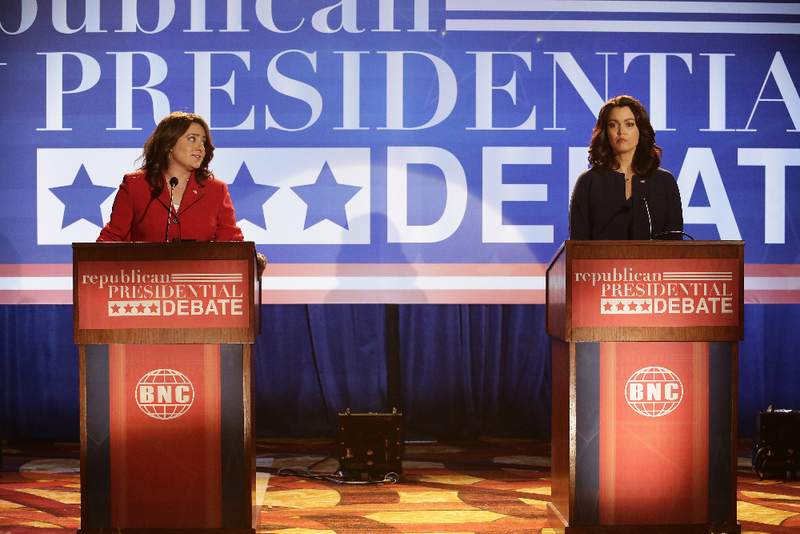 Liv is back to running Mellie’s presidential campaign as they reach a critical point. Get a sneak peek of this week’s Scandal (“Buckle Up”), airing Thursday, April 28 at 9:00pm ET|PT on ABC. Last week’s Scandal was insane! The entire time I thought Liv was Pope-d her dad and Jake (or should I say Pete Harris!!! ), come to find that Eli/Rowan was Pope-ing us all! I don’t know why I’m still shocked every time Papa Pope shows his callous side. That man sat in a church and threatened to kill Jake if Liv didn’t convince him to go through with wedding. WHAT?! Of course Liv completely shatters Jake’s heart, using her supposed love for Fitz against him. I think what I found most interesting about “Till Death Do Us Part” was learning Jake/Pete’s past. I didn’t think it would be possible, but I spent the episode feeling really bad for him. Pete suffered a lot of abuse and anguish in his childhood, particularly at father’s hands (his dad battered his mother and raped his younger sister, ultimately driving her to commit suicide after finding out she was pregnant…). And when Pete was about to be dishonorably discharged from the Navy, Papa Pope swooped in and turned him into the Jake Hamilton Ballard we now know. Papa Pope completely broke Pete down with the usual B613 physical and psychological torture. But that the same time the two men formed a deeper relationship. Pete needed a father-figure, and Papa Pope was quick to step in and fulfill that role. So it absolutely makes sense that Jake would return to his B613 roots time and time again. And as far as Eli is concerned, Jake is his shining star and ticket back into the White House. Jake, director of the CIA, marries DC socialite Vanessa Moss, and is set to be Edison Davis’ VP running mate. Take a look at two clips from the upcoming show. In the first, Liv and Lizzie prepare their respective candidates to schmooze with Florida’s Governor Baker for her endorsement. Both Mellie and Susan’s campaigns depend on being able to convince the governor to throw her political weight behind them. Ugh, I really need for Susan to find out that David was cheating on her with Lizzie! I don’t want Susan to be anywhere near those two… though it does seem like David really loves her. Also, I’m excited about seeing the Republican primary debate, mostly because Hollis is ridiculous! Take a look at 15+ images from “Buckle Up” and remember to tune into ABC this Thursday at 9:00pm ET|PT for the new Scandal. I’ll be live tweeting (@WeSoNerdy) so come watch with me!